You can create a UAE virtual phone number and stay connected with associates, customers or friends located in UAE without a physical location in the UAE. 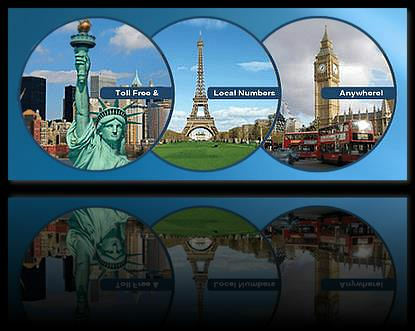 UAE virtual numbers enable redirecting calls to any mobile phone, landline, fax, VoIP, PBX, call center in any country. Forward calls from UAE to any phone worldwide. الامارات العربية المتحدة أرقام الهواتف الافتراضية متاحه مجانا أو كرقم محلي في دبي. تحويل المكالمات إلى اي دوله من رقم هاتف الامارات الكتروني. You can create a phone presence in the UAE and connect with associates, customers or friends located in UAE without a physical location inside UAE using a UAE Virtual Phone Number. The UAE generally leads the Middle East Arab countries in ICT rankings, with a well-developed and technologically advanced telecom sector and high levels of mobile and broadband penetration. The UAE has two fixed network and mobile operators: the original incumbent Etisalat and operator du, which launched services in February 2007. Fixed-line competition increased recently with the TRA announcing in late 2015 that fixed network sharing had finally been implemented across the country with both operators now able to offer and market services in locations previously withheld. Etisalat is one of the most profitable telecom organisations in the region; it is a large contributor to UAE’s economic development, (after petroleum) and one of the largest companies in the Middle East. Besides being the incumbent telco in the UAE, Etisalat operates in several other African and Asian countries.